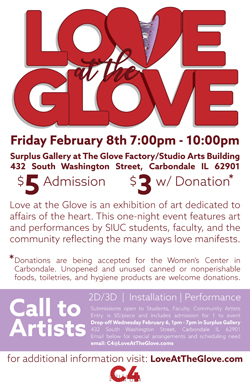 Love at the Glove, the Valentine’s Day art show tradition, returns to the Surplus Gallery in the Glove Factory at Southern Illinois University Carbondale next week. The event is from 7 to 10 p.m., Feb. 8. Admission is $5; $3 with donated canned or nonperishable foods or toiletry and hygiene items for The Women's Center in Carbondale. Event organizers note that the exhibition typically includes adult themes and is not, therefore, an event suitable for children or minors. Organizers also retain the right to deny entry of artworks that are hateful or would aim to hurt a person or people. The Surplus Gallery is inside the Glove Factory at 432 S. Washington St., Carbondale, and is home to studio and exhibit space for School of Art and Design students. Artist submission is open to faculty, students and community artists. Artists who want to participate should bring their exhibit submissions to the Surplus Gallery from 1 to 7 p.m., Feb. 6. Email C4 for special arrangements and scheduling needs. The cost for each exhibit piece is $5. The exhibit piece fee includes one free admission to the event.